Staying on animation, nearly a decade ago, smash hit movie "Avatar" dazzled audiences with its blend of reality and incredible virtual effects. One of the key figures behind the sci fi animation was Taiwanese virtual cinematographer Wang Cheng-yao. Now, at 31 years old, he wants to bring home his leading-edge technology to raise Taiwanese cinema to new heights. Wang Cheng-yao exudes confidence as he speaks. He and his team are the developers of a type of virtual cinematography that’s drawn interestat home and abroad, even from Hollywood filmmakers. “Avatar” set the world’s box office record when it took home nearly US$2.8 billion in 2009. The characters’ visual effects and the incredible scenery came out of a partnership between Hollywood and Wang’s team. This film technique is called virtual cinematography. Performances and images are brought into the live film set through VR technology. This is the most innovative aspect of Avatar. 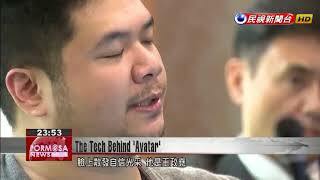 Avatar’s upcoming sequel also makes use of this technique.Wang has lived abroad for many years, and now he wants to bring this cinematography technology to Taiwan. I think that the teams in Taiwan have only a short window of opportunity. Investing in this new technology now will put them at the same starting line as the others, so that we don’t fall behind our rivals. Wang says thatamid intense industry competition, virtual cinematography can be a tool that helps filmmakers elevate Taiwanese cinema.